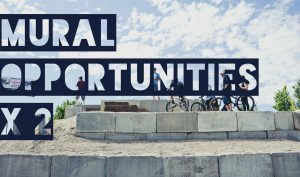 The Salt Lake City Arts Council and Parks & Public Lands are pleased to announce two new opportunities for artists or artist-led teams to respond with proposals for murals at the 9 Line Bike Park. In 2017, Parks and Public Lands, with community support and interest, expanded the existing bike park located at 700 West and 900 South to provide users and Salt Lake City residents with a unique recreational amenity. The project area encompasses 1.3 acres and is utilized by riders of varying ages and skill levels. The Bike Park includes new jump lines, a pump track, a shade structure, drinking fountain, and seating for riders and non-riders alike. ELIGIBILITY – The Shipping Container and Starting Ramp Mural Opportunities are open to all artists and/or artist-led teams based in Utah. Artists residing in Glendale are strongly encouraged to apply. SUBMISSION REQUIREMENTS – All applications must be submitted through the Submittable website. If proposing a mural for both the Shipping Container and the Starting Ramp Blocks, artists must submit a separate application for each opportunity. Links below. QUESTIONS – All questions regarding this RFP are to be directed only to the Salt Lake City Public Art Manager by email at katherine.nix@slcgov.com. Please review the complete RFP links below prior to emailing any questions. No phone calls please. Mural Size: 208 sq. ft.
Mural Size: 400 sq. ft.